A Construction Laborer will perform many tasks in construction sites that require a high level of physical labor. 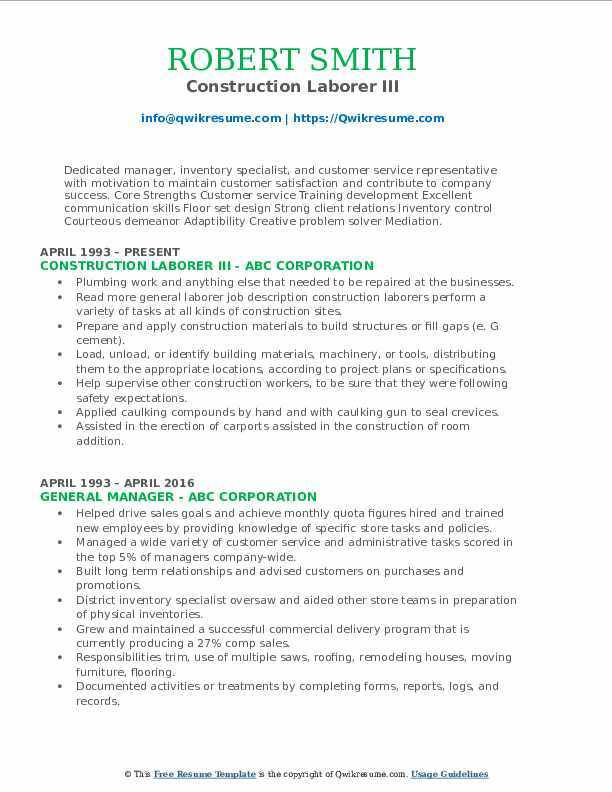 Primary accountabilities listed on the Construction Laborer Resume include – loading and unloading materials which are used in construction sites, cleaning and preparing the job site by removing debris and other elements; compacting earth and preparing it for construction, assisting craft workers, following instructions as given by the supervisor, performing site clean-up and helping equipment operator and other skilled labor when necessary. 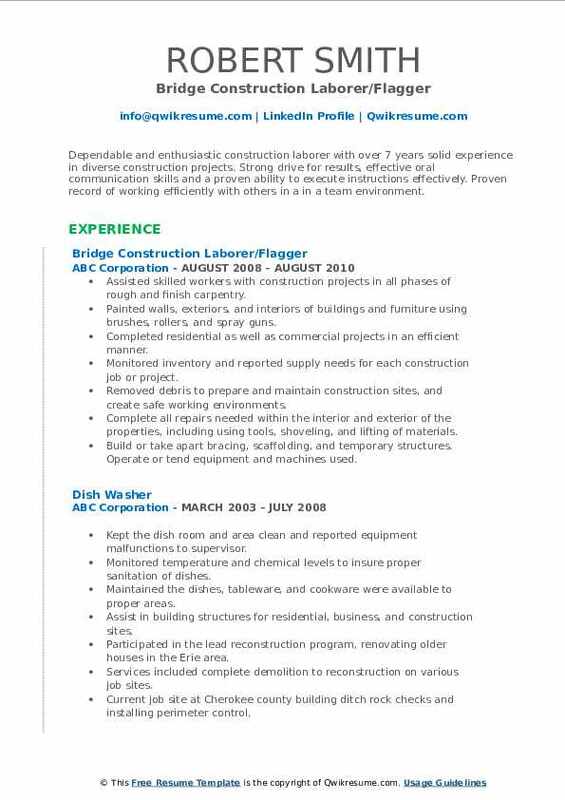 The job role requires a lot of physical labor, but apart from that, the following skills are also needed – the ability to work under all weather conditions, punctual and reliable, experience working as general labor, ability to lift heavy equipment, excellent stamina and ability to travel out of the city. A high school diploma or GED is the minimum level of education required for the post. Summary : Hardworking Construction Worker who is dependable and reliable. Motivated to get along well with others and exceed expectations. Thrives in a fast-paced environment and works to complete projects quickly and efficiently. Maintain records, document actions and present written progress reports. Arrange for subcontractors to deal with special areas such as heating and electrical wiring work. Objective : To secure a position which will permit me to use the skills and other related knowledge acquired during my time in farming, construction, and an as electrician's assistant. Perform tasks involving physical labor at building, highway, and heavy construction projects. Aided in building house additions, setting septic tanks, and clearing trees. Perform tasks involving physical labor at building, highway, and heavy construction projects, tunnel and shaft excavations, and demolition sites. Monitored inventory and reported supply needs for each construction job or project. Objective : Corrections Officer focused on maintaining peace, security and safety within correction centers and federal prison systems. Extensively trained in crisis prevention and intervention. Meet with local township and borough building inspectors prior to foundation installation to ensure preparatory work has been done to local code specifications. Assisted large crews in erecting, repairing and the wrecking of buildings and bridges. Assisted skilled workers with construction projects in all phases of rough and finish carpentry. 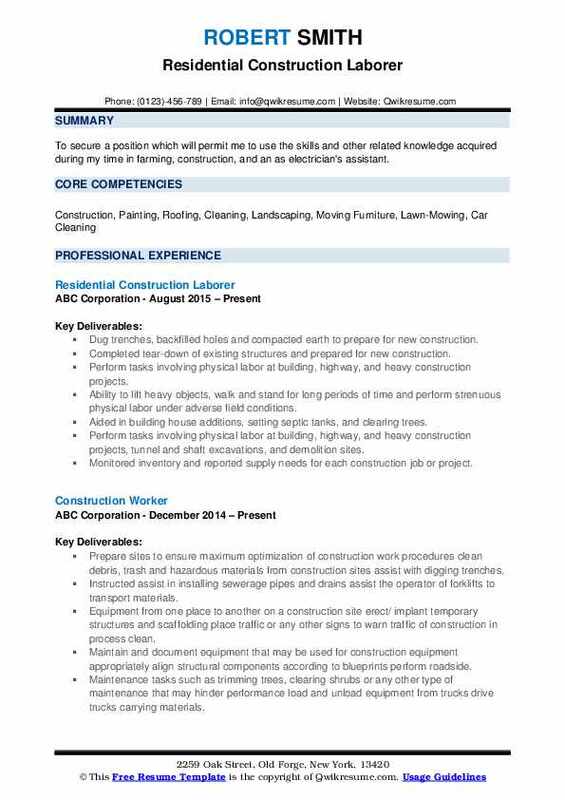 Headline : Dependable and enthusiastic construction laborer with over 7 years solid experience in diverse construction projects. Strong drive for results, effective oral communication skills and a proven ability to execute instructions effectively. Proven record of working efficiently with others in a in a team environment. Painted walls, exteriors, and interiors of buildings and furniture using brushes, rollers, and spray guns. Completed residential as well as commercial projects in an efficient manner. Removed debris to prepare and maintain construction sites, and create safe working environments. Complete all repairs needed within the interior and exterior of the properties, including using tools, shoveling, and lifting of materials. Build or take apart bracing, scaffolding, and temporary structures. Operate or tend equipment and machines used. 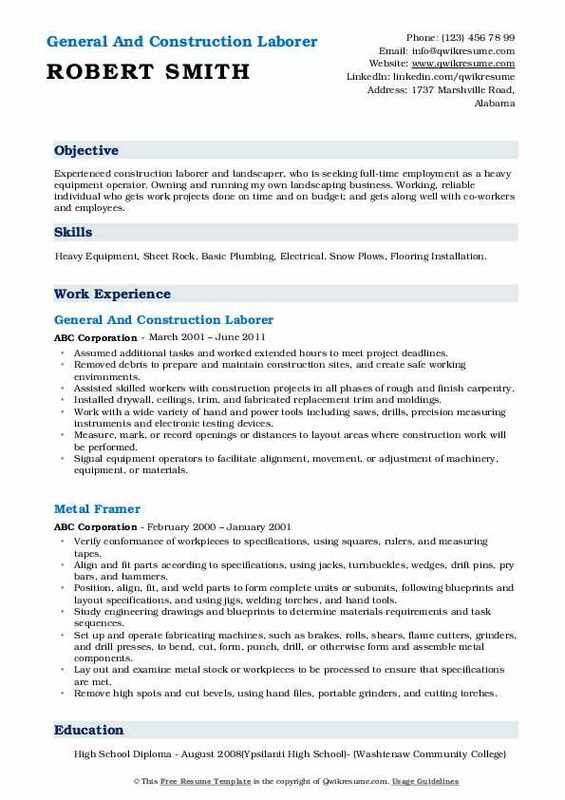 Summary : Dependable Construction Laborer with more than six years in the construction industry. 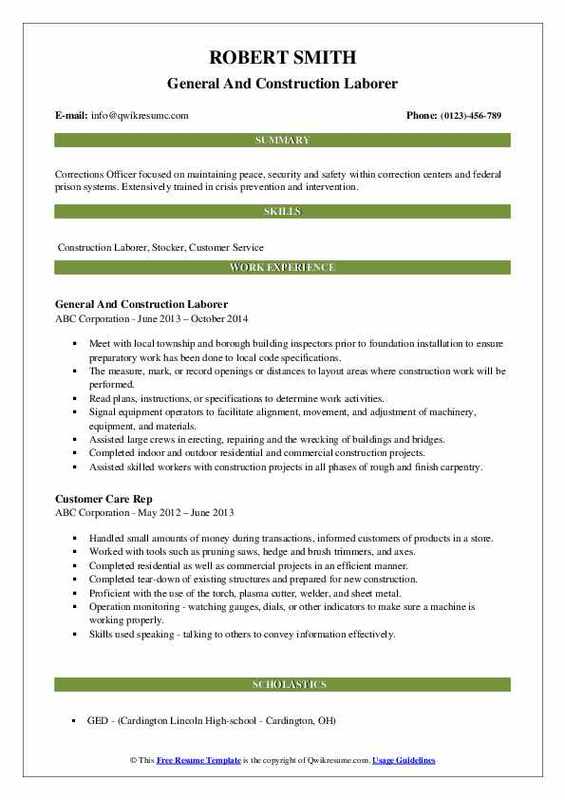 Seeking the opportunity to prove efficiency and surpass work ethic within a challenging laborer position. Involving physical labor at building, highway, and heavy construction projects, tunnel and shaft excavations, and demolition sites. Mopped, brush, or spread paints, cleaning solutions or other compounds over surfaces to mop, brush, or spread paints, cleaning solutions, or other compounds over surfaces to clean them or to provide protection. Placed consolidate, and protect case-in-place concrete or masonry structures. Positioned join, align, and seal structural components, such as concrete wall sections and pipes. Shoveled cement and other materials into portable cement mixers; and mix, pour and spread concrete. Signal equipment operators to facilitate alignment, movement, and machinery, equipment, and materials. Secured and managed demolition areas according to the outlined blast radius. 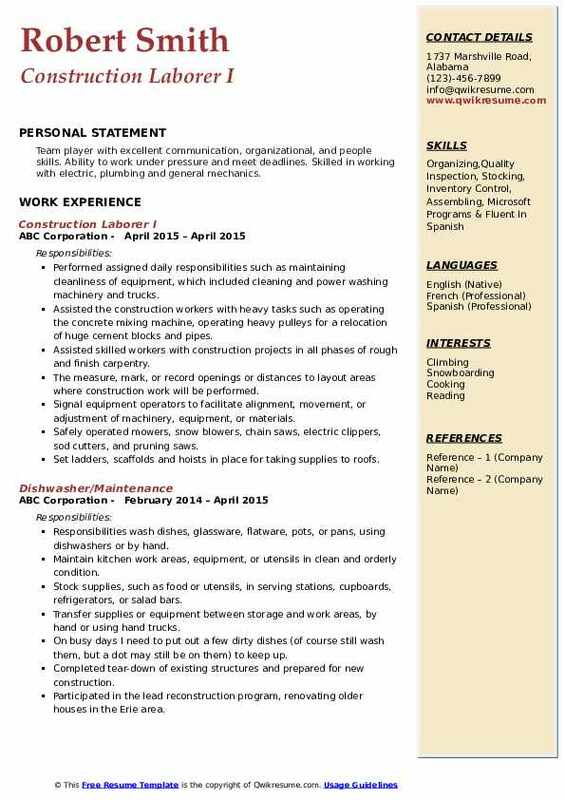 Summary : Experienced construction laborer and landscaper, who is seeking full-time employment as a heavy equipment operator. Owning and running my own landscaping business. Working, reliable individual who gets work projects done on time and on budget; and gets along well with co-workers and employees. Skills : Heavy Equipment, Sheet Rock, Basic Plumbing, Electrical, Snow Plows, Flooring Installation. Assumed additional tasks and worked extended hours to meet project deadlines. Installed drywall, ceilings, trim, and fabricated replacement trim and moldings. Work with a wide variety of hand and power tools including saws, drills, precision measuring instruments and electronic testing devices. Summary : Dedicated manager, inventory specialist, and customer service representative with motivation to maintain customer satisfaction and contribute to company success. Core Strengths Customer service Training development Excellent communication skills Floor set design Strong client relations Inventory control Courteous demeanor Adaptibility Creative problem solver Mediation. Plumbing work and anything else that needed to be repaired at the businesses. Read more general laborer job description construction laborers perform a variety of tasks at all kinds of construction sites. Prepare and apply construction materials to build structures or fill gaps (e. G cement). Help supervise other construction workers, to be sure that they were following safety expectations. Assisted in the erection of carports assisted in the construction of room addition. 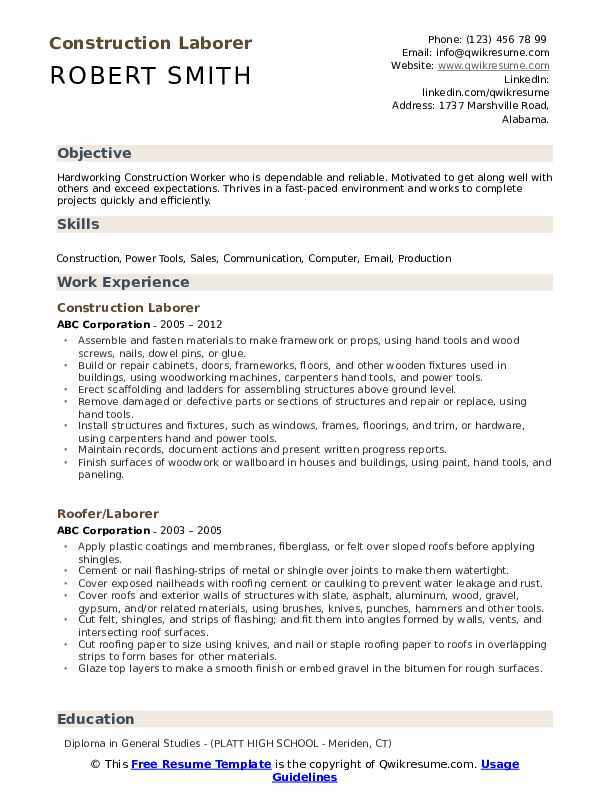 Objective : To obtain a job as a Machine Operator, Material Handler, or Concrete Finisher. 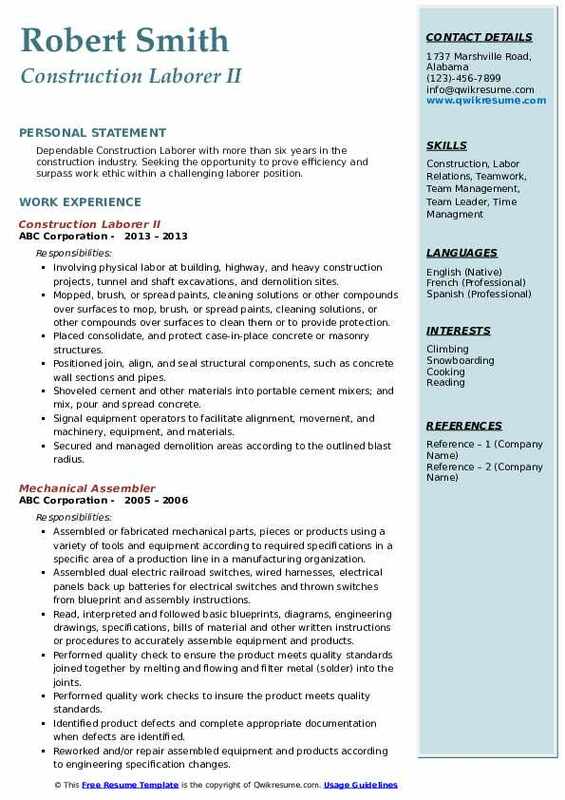 Ability Summary Experienced machine operator who can meet or exceed production rates, set up, operate and equipment (Forklift/Bobcat/Backhoe), certified MSHA Mine Safety Classes, and excellent safety record on the job. Prepared and maintained equipment for construction and renovations responsible for mixing different compounds for renovation: concrete, plaster, etc. Provided comprehensive construction support to complete indoor and outdoor residential and commercial projects. 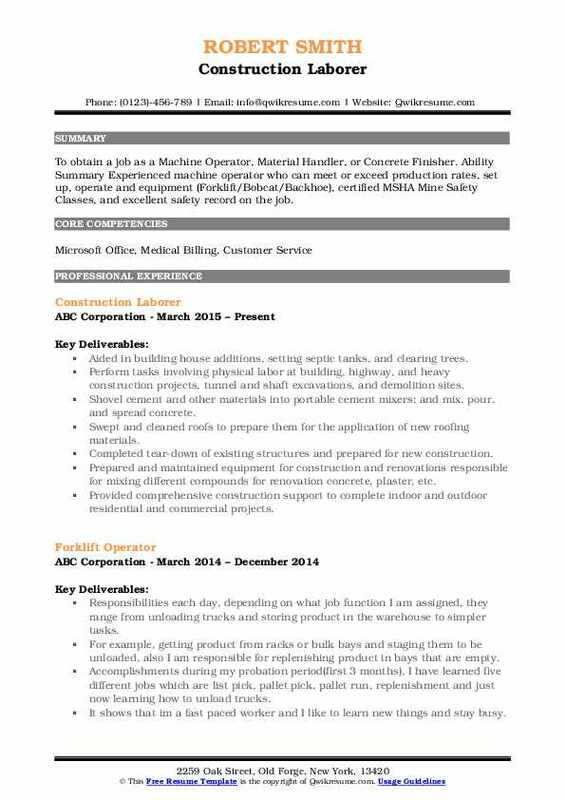 Objective : Team player with excellent communication, organizational, and people skills. Ability to work under pressure and meet deadlines. Skilled in working with electric, plumbing and general mechanics. Performed assigned daily responsibilities such as maintaining cleanliness of equipment, which included cleaning and power washing machinery and trucks. Assisted the construction workers with heavy tasks such as operating the concrete mixing machine, operating heavy pulleys for a relocation of huge cement blocks and pipes. 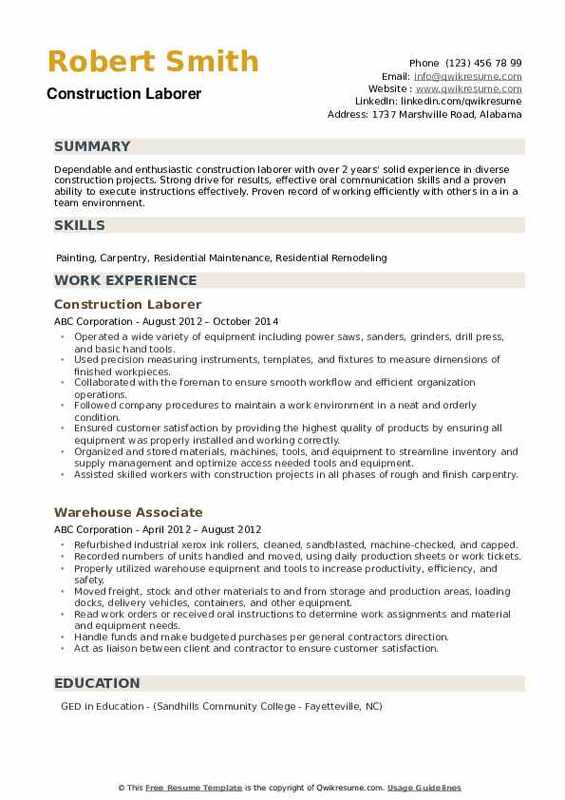 Objective : Dependable and enthusiastic construction laborer with over 2 years' solid experience in diverse construction projects. Strong drive for results, effective oral communication skills and a proven ability to execute instructions effectively. Proven record of working efficiently with others in a in a team environment. Operated a wide variety of equipment including power saws, sanders, grinders, drill press, and basic hand tools. Used precision measuring instruments, templates, and fixtures to measure dimensions of finished workpieces. Collaborated with the foreman to ensure smooth workflow and efficient organization operations. Followed company procedures to maintain a work environment in a neat and orderly condition. Ensured customer satisfaction by providing the highest quality of products by ensuring all equipment was properly installed and working correctly. Organized and stored materials, machines, tools, and equipment to streamline inventory and supply management and optimize access needed tools and equipment.